ACL fans need no introduction to Norah Jones – the eclectic singer/songwriter has graced our stage twice before. 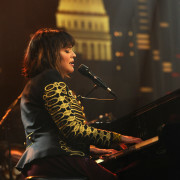 Her upcoming third taping on October 18, however, comes on the heels of her acclaimed album Little Broken Hearts. Not only is Hearts a classic break-up album, but it also comes with imaginative production and co-writing from the iconoclastic Brian Burton, AKA Danger Mouse, who has himself visited ACL as part of Gnarls Barkley. Combining Burton’s otherworldly textures with Jones’ raw, heart-on-sleeve writing produces what The Boston Globe called “a striking change-up” and The Philadelphia Inquirer deemed “her best album in ages.” Meanwhile NPR notes, “Always more versatile than most people think, Jones fits all of this smart material to perfection, marking her second decade as a star while making her sound cooler and more unflappably sophisticated than ever.” We’re proud to present an ACL veteran moving in new directions. We hope you can join us.